Yesterday, I had the privilege of presenting Amman Imman’s mission to students at Goddard College in Plainfield, Vermont. I also told them about the collaboration of Montessori schools around the world to build at least one water source in the name of Montessori. People here at Goddard College find this partnership with Amman Imman and Montessori schools to be an inspiring example of collaborative social action, and are interested in watching its development as schools not only raise funds, but also engage their students in learning about the root causes of why the Azawak region and its people find themselves in such dire circumstances. 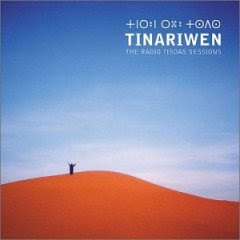 As people gathered in the room, the music of Tinariwen, Tuareg musicians from Mali, carried them to the faraway lands at the edge of the Sahara. Framed photographs of the faces of the people that Ariane came to know in the Azawak immediately captivated the Goddard students. One of the most compelling aspects of this project that first moved me to be involved, and that also impressed the students here at Goddard, is how Ariane conveys to us not only the devastation that rules the daily life of the people in the Azawak region, but also who they are as human beings. She talks about them by their names and shows us their beauty. The degrees of separation we feel when we see pictures on television and in the newspaper of people dying in Africa are reduced by Ariane’s familiarity. We see Againakou, giving her son Agoubouley a drink of water that is darker than hot chocolate. We see Takat, nine years old, removing lice from eight year old Mouheini’s hair as she smiles a beautiful smile. 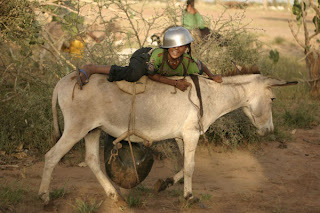 We see Soutout, age 10, smiling on the back of a donkey after returning from the 35 mile trip to fetch water. We see the gentleness in the eyes of Ariane’s host father as he poses with his family, and we believe in his generosity when he travels 20 miles under the moonlight to bring his guest meat for the morning. By putting a name to these beautiful faces they become our friends. It doesn’t matter that these people live in tents or small huts in a village in Africa while I live in an apartment outside of Washington, DC. They are human beings with families, just like me. I can empathize with the grief that a mother in the Azawak feels when two of her children die from lack of water. I can imagine the worry a parent feels when her little girl leaves on the back of a donkey at 3 o’clock in the morning to travel 17 miles each way to bring a little water back for the rest of the family. Even though their circumstances are so different, and they live in conditions way beyond what I can imagine from the comfort of my home and the ease with which I can reach for a glass of water, I can relate to their anguish and pain. I am honored to be working with Montessori schools and students to bring resources to the people in this region. As Amman Imman builds the first two wells and paves the way for larger organizations to bring much needed resources, eventually people in the Azawak will have clean water, and children like Takat, Mouheini, Soutout and Agoubouley, will have access to health care, education and maybe even time to play.